18TH DEC 1910, IN HIS 78TH YEAR. Ivie Campell was born at Garclaugh one of six children of George Campbell and Margaret Boyle. In 1773 he married Jean Gemmel and they lived at the House of Water where together they had three children George, William and Margaret. After Jean died Ivie moved to Dalgig in 1785 and a year later he married Margaret Dunbar with whom he had five daughters Isabella, Jane, Thomina, Janet and Wilhelmina along with one son Ivie (II). Ivie Campbell II married Jean Richmond and together they had five children, four of them died in infancy with a son Ivie (III) surviving. In 1833 he was awarded the Highland and Agricultural gold medal in recognition of reclaiming 570 acres of waste hill land at Dalgig by ploughing and liming and then sowing it out in first rate pasture. A second gold medal followed seven years later for the prize essay he submitted to the Society detailing his methods in transforming the lands of Dalgig. Ivie, with his brother-in-law John Richmond as his mentor were soon breeding prize-winning Ayrshire cows at Dalgig. He went on to win countless first prizes thanks to bulls such as Tarn, Cardigan (for whom they refused an offer of 100 shillings) and Clarendon. With all this good milk try as he might he could only win local prizes at New Cumnock and Old Cumnock for his cheese, despite sparing no expense in having his dairy maids trained in the cheddar system. Prizes were won for black-faced sheep and Kleber and Lamartine were his best two Lanarkshire bred Clydesdale horses, while Revolter was his favourite saddle horse. Curling, which he played for forty years, was his favourite past-time and he held the New Cumnock Challenge medal. Ivie’s passion however was his beloved greyhounds and hare-coursing. In 1861 his dog Canaradzo won the prestigious Waterloo Cup (right) at Liverpool, but unfortunately a few days late it died after an accident while coursing on the lands of Dalgig. Ivie also like to read, mainly religious works, and indeed in 1828 he was one of the originators of the library in New Cumnock. As a young man he had studied at Glasgow University with the intentions of becoming a minister. However, he returned to assist his ageing father to farm Dalgig. While at Glasgow he befriended the famous Scots poet Robert Pollok, author of ‘Tales of the Covenanters’. In his possession at Dalgig was the family’s Covenanting Bible, dating back to 1682 as well as other Covenanting relics. In 1684, three Covenanters were martyred on Carsgailoch hill above Dalgig and when a monument was being erected there in 1826 to their memory, Ivie witnessed their bodies and he recovered a lock of hair and piece of woollen mitten which could later be seen at Dalgig for many years and are now held in the Baird Institute, Cumnock, along with a fragment of the original Covenanter’s headstone. Dalgig was always a busy place with the Campbell family and their relatives, a range of agricultural labourer, servants and maids as well as many a poor passing travellers given shelter and board. Ivie’s wife Jean Richmond died in 1853 and two years later he married his housekeeper Jean Lee. 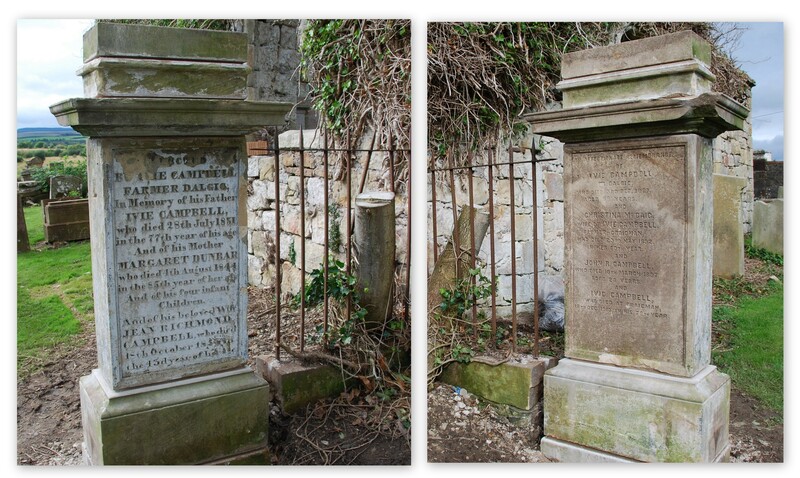 After a long illness, Ivie Campbell passed away in 1867 and lies buried in the family plot adjacent to the walls of the Auld Kirk. Ivie Campbell III married his cousin Christina McCaig and they farmed at the nearby Craigman. Ivie recorded much of the genealogy of the family, fondly used by the ‘Ivie League’ of genealogists that exist today from New Cumnock to New Zealand. Their son Ivie became a commercial traveller and was active in the Brethern Church producing a monthly magazine called ‘The Interpeter’. The last in this line of Ivie Campbells he died in 1920 at his home in Glasgow. Christine Clement of Te Puke, New Zealand has created a treasure trove of information on many of the farming families of the parish of New Cumnock. On following the trail of the descendants of Ivie Campbell of Garclaugh and later Dalgig, she founded the ‘Ivie League’.